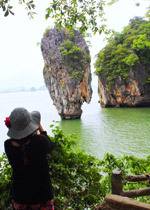 James Bond Island: The main set of the world class movie shooting-James Bond 007. The Production team of the movie had agreed to use this area because of there are many beautiful virgin nature point. 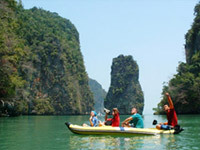 Phang-Nga Bay is the other name of 007 Movie's set. 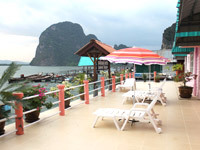 There are the myterous completed nature safaris both in Sea and on the Land. 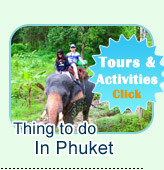 Jc.Tour Phuket is going to invite you to live in the location of the "James Bond 007" Movie as temporary-2 Days 1 Night. The bellowing are the Highlight Pictures and the Brief Detail of the trip. 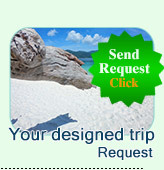 Could you please see and read them before submit the booking? 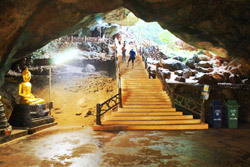 The golden monk cave Temple or Suwankhuha Temple or in the other name "Monkey Cave Temple." This is an important highlight of the trip. 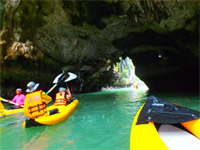 Discover the James Bond 007 Movie Set must be used as the private Long tail boat-more easy to go and get in the narrow area of the Sea Cave Safari. 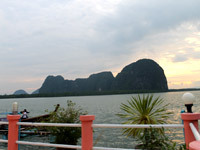 It is the real wonderful point on the Ocean, Phang-Nga Bay. We are going to show you in every corner. The Floating Village or Fishing Village at Panyee Island is the area of local fisherman live. 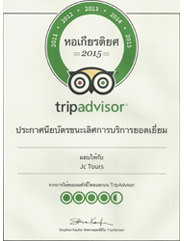 It is a very interesting place for everyone. 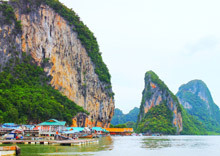 We take you to see every corner of the Phang-Nga Bay. And the meal will be served on the "Local Floating Village." 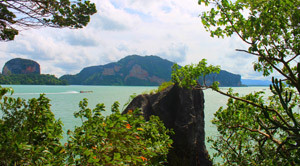 Remembrance Point of the Movie "James Bond 007" is here-Khao Ping Kan Island. 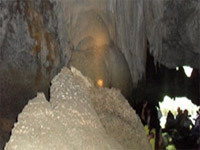 A great view and nice to stop to discover the caves, the bays and the beach on here, we will show you all. 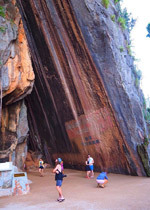 Some beautiful point of this bay, we are unable to get in by the big boat or Long Tail boat, we must use canoe boat. 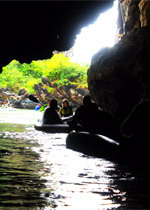 And our paddle guide will inform you all about the detail of the caves. 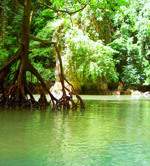 On the land of Phang-Nga Bay, we take you to visit the beautiful Waterfall amid the safari with the thick nature jungle.